The Knox County Library Annual Used Book Sale is coming! Saturday, April 1: Members Only Day, 10 a.m.–6 p.m.
Sunday, April 2: Open to the public, 10 a.m.–6 p.m.
Monday, April 3: Half Price Day! Open to the public, 10 a.m.–6 p.m.
Tuesday, April 4: Bag Sale Day! Open to the public, 10 a.m.–3 p.m.
Over 50,000 carefully selected used books arranged by topic will greet you when you enter the Jacob Building. The sale will have something for everyone, from bestsellers to genre fiction to children’s books and more! Giveaway: win tickets to the Junior League’s 2017 Bag-A-Bargain rummage sale! UPDATE: The winners are Margie Elizabeth Turner-Schnell, Stephanie Bowling, Michelle Brown, Kendall Rae Prager, Chris Mitzi Hendrich, and Ash Lee. Thanks to all who entered! I am proud to be a Sustaining Member of the Junior League of Knoxville. I joined the Junior League in 2002, and have thoroughly enjoyed my League experience. My favorite event every year is Bag-A-Bargain, the giant rummage sale for which the League is famous. This will be the 31st year of Bag-A-Bargain! 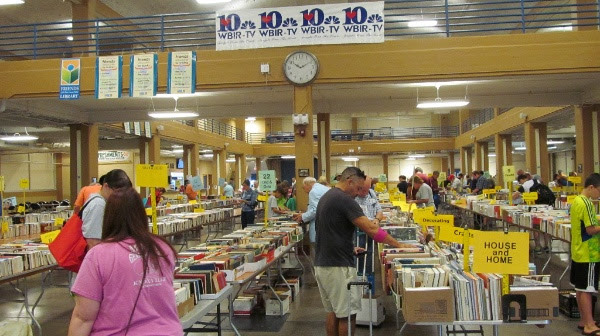 This year’s Bag-A-Bargain sale will take place on Saturday, March 4 from 8 a.m. to 12 p.m. at the Jacob Building in Chilhowee Park (near the Knoxville Zoo). Thanks to the League for allowing me to offer a giveaway for you! Go to the Thrifty Christy Facebook page and look for this post to enter to win one of six tickets to shop at Bag-A-Bargain on March 4! You’ll want to RSVP to the official Facebook event here as part one of your giveaway entries. The giveaway ends at midnight on Thursday and I’ll announce the winners Friday morning on Facebook. You’ll have 24 hours to claim your tickets. Happy shopping! Purchase Buttermilk Sky Groupon now for Pi Day celebration later! Buttermilk Sky Pie Shop has a Groupon available: $12 for $20 to spend on delicious pie! There are two locations participating: the one in Bearden, and the one in West Hills. We visit Buttermilk Sky with my kids to celebrate Pi Day each year on March 14 (3.14, get it?) and we are excited to save a little on the pies we’re planning to purchase! Go here to get this Groupon before it disappears! Giveaway: win tickets to Beauty and the Beast from Adrian Jones with Kingdom Concierge! UPDATE: The winner of the Beauty and the Beast tickets is Kristin Deal! Thanks to all who entered! Kristin, Adrian will be in touch with you regarding your tickets, so check your Facebook messages! My friend Adrian Jones with Kingdom Concierge – an amazing travel agency specializing in Disney resorts and travel – is hosting a private VIP showing of the new Beauty and the Beast movie on March 18 for all her clients. She wants to give you a chance to be there as well, so she has given me a family 4-pack of tickets for one lucky family to win! Read on for details! To enter to win four tickets to see Beauty and the Beast on March 18 at 10 a.m. at Carmike Cinemas in Maryville, go to the Thrifty Christy Facebook page and look for this Beauty and the Beast post! For more information on Kingdom Concierge and all the ways Adrian can help you have a stress-free Disney vacation, visit her on Facebook here, or request a quote here! This giveaway ends at midnight EST on Sunday, February 19. I will choose a winner on Monday, February 20 using random.org and will contact him or her via Facebook. Giveaway open to US readers only. You must be 18 or older to enter. Disclosure: I received tickets for my family plus additional tickets from Adrian Jones at Kingdom Concierge to give away to my readers. Winners will be contacted via Facebook and are responsible for replying within 48 hours to claim tickets. All opinions expressed in this post are my own. The Knoxville Opera will be performing Puccini’s La Boheme on February 10 and 12. If you’d like to see it at a really deep discount, consider attending the student dress rehearsal TONIGHT (Wednesday, February 8 at 6:30 p.m.) This full dress rehearsal is exactly the same as the regular performance (the show runs without stopping with full costumes/set) and is FREE for students and just $5 for accompanying adults (cash only, MUST be accompanying a student). You’ll enter the Tennessee Theatre through the Gay Street entrance beginning at 5:30 p.m. For more info on the student dress rehearsal, go here. Right now you can get the audiobook version of “Teaching from Rest”, by Read Aloud Revival host and popular speaker Sarah MacKenzie, for just $4.95! There’s no need to have an Audible subscription to grab a la carte deals like this from Audible. Just follow the link, check out on Amazon like normal, and then listen with the free Audible app. I found this book to be SO encouraging, and I purchased this audiobook deal because even though our local library has “Teaching from Rest,” it is ALWAYS checked out. Plus, this way I can listen while walking on the Greenbelt or something else fun! I plan to make listening to this book an annual habit. Also, if you love audiobooks, here are two more great deals! (Remember, Amazon’s prices can change at any time.) One great way to get free or cheap audiobooks is by purchasing the Kindle version of the book and then adding on the audiobook version. You can grab Tom Sawyer on both Kindle AND Audible for $0.99! ? ? Head to this link to get the Kindle book for free, and then before you check out, click the box that says “add Audible narration for $0.99.” You’ll get the audiobook version shown above, read by Nick Offerman -regularly $19.99! You can also get “The Wizard of Oz” on Kindle and audiobook for just $0.99! Just head to this link, and right under the “buy now” button, choose “add Audible narration for .99” then check out like normal. You’ll get the Kindle book for free, and – here’s the BEST part – the audiobook version read by Anne Hathaway for only $0.99! Save the date for the Junior League’s 2017 Bag-A-Bargain! The Junior League of Knoxville’s 31st Annual Bag-A-Bargain event will be held on Saturday, March 4, 2017, from 8:00 am until 12:00 pm, inside the Jacob Building at Chilhowee Park. Admission to Bag-A-Bargain is $5.00 per person. Tickets to the event are $4.00 per person if you either bring a canned food item for Mission of Hope, or bring the coupon from the Knox County Schools coupon book that is good for $1 off Bag-A-Bargain admission. Tickets that are purchased online will be available at will-call on the day of the event. You can purchase tickets here.